Ready to place an order, Call Today! 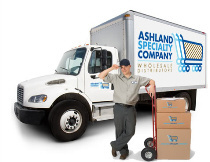 Ashland Specialty Company is a wholesale distributor and warehouse located in Ashland, Kentucky. We are grocery and convenience store wholesale distributors providing goods such as food, cigarettes, paper products, candy, etc. and serving the Kentucky communities of Ashland, Lexington, Winchester, Mt. Sterling, Morehead, Olive Hill, Emerson, Grayson, Princess, Rush, Ironville, Maysville, Wiliiamstown, Cynthiana, Paris, Flemingsburg, Louisa, Paintsville, Prestonsburg, Pikeville, Williamson, Hazard, Burning Springs, Manchester, Berea, Irvine, Stanton, Richmond, KY. In West Virginia we also serve the areas of Huntington, Barboursville, Scott Depot, St. Albans, Charleston, Branchland, Sissonville, Kenna, Chelyan, Beckley, Oak Hill, Welch, Princeton, Bluefield, Lewisburg, Frankford, Kanawha Falls, Mt. Nebo, Summersville, Spencer, Parkersburg, Vienna, Weston, Clarksburg, WV. Also, we are able to serve communities in Ohio such as Wheelersburg, Ironton, Gallipolis, Jackson, Wellston, Waverly, Chillicothe, Athens, Hillsboro, Georgetown, Wilmington, Blanchester, Circleville, South Point, Burlington, Rockbridge, Lancaster, Ravenswood, Marietta, OH. Copyright © 2013 Ashland Specialty Company. All Rights Reserved.